Cigarette 38 Top Gun: A classic performer in contemporary dress. 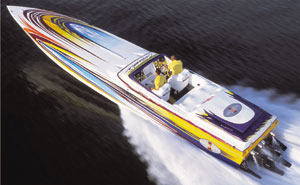 As it has been for so many years, Cigarette's 38 Top Gun is one of the first names in offshore go-fast boats, and the model we tested at the Fort Myers, Fla., stop of our Performance Trials gave us no reason to think otherwise. 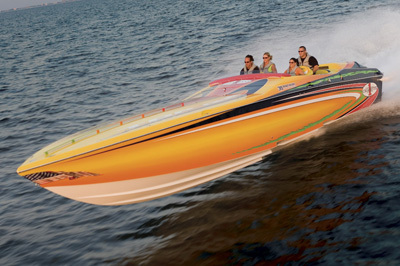 Equipped with a pair of Mercury Racing HP525EFI engines with 1.5:1 Bravo One drives with 2-inch "shorty" Sport Master gear cases, the Top Gun could hold its own in any open ocean. Slathered with a mesmerizing paint job and fitted with top-shelf hardware, the 38 Top Gun certainly demonstrated its namesake. The Top Guns hull featured two steps, the first of which was located even with the fairing and the second was about 6 feet aft of the first. The keel remained sharp through all three running surfaces. The 4-inch-wide chine also continued through all steps. Of the four strakes, only the outside continued after the first step. At the transom, the boat was fitted with a 10-inch-wide notch. The configuration created sure-footed handling. Since it's a stepped-bottom, it turned best with the drives set at neutral or just a bit above, but the boat earned high marks when put through slalom turns at 30, 40 and 50 mph. Sweeping turns at high speeds were just as assured. The precise mold work on the boat's bottom, meaning the sharp keel and laser-straight strakes contributed to the boat's manners offshore. In 3- and 4-footers the boat knifed through swells with aplomb. Inlets on Florida's east coast—where Cigarettes are built—are almost always rough and confused, and this boat will get you through any of them in a hurry. Just add throttle and a little negative tab and break on through. Bolted to the aforementioned HP525EFI engines and 1.5:1 Bravo One drives were stock Bravo One 15 1/4" x 32" propellers rotating outward. Even with outward rotation, the boat carried the nose nice and high with no trouble, and of course, that rotation afforded excellent maneuverability around the docks. 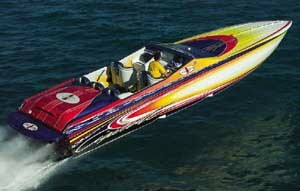 In smooth water, the boat cruised at 64 mph at 4,000 rpm as it delivered a respectable 1.3 mpg. Adding another 500 rpm pushed the boat to 76 mph, which spoke volumes about the hull's efficiency when paired with this propulsion package. It topped out at 86.4 mph on radar. 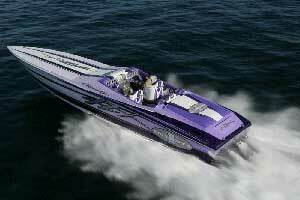 Remember, that's a mere 1,000 horsepower pushing a 38-footer to that kind of speed. We found the sweet spot to be just above neutral drive trim and the boat never needed any tab while we tested on the smooth waters of the Intracoastal Waterway. Eyeballing the hullsides of the 38 Top Gun, we found no waves or imperfections in the boat's mold work. It was spot-on from bow to stern, which made it an ideal canvas for the custom paint job that included red, yellow and orange fades blended with hard lines of color separation. The deck rail also had been blended in with the custom graphics. The results, as you can clearly see, were dramatic. 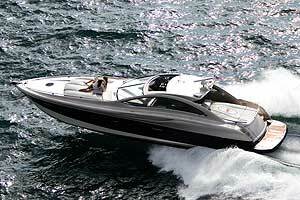 Cigarette protected the hullsides with an anodized black aluminum rubrail with a rubber insert. Though it wasn?t painted, it blended into the graphics. 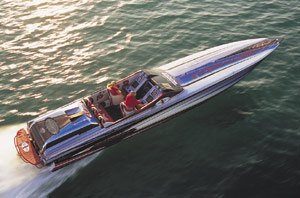 The manufacturer also fitted the boat with a new kind of aluminum swim platform, which included a ladder that dropped down between the drives and a Cigarette logo at its center. The support rails on the sides also could pull duty as de facto swim ladders. Under the hatch, which was positive-molded on the underside and upholstered up top, it only got better. 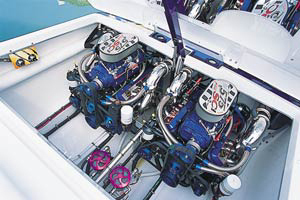 Engines were affixed with Mercury Racing side-by-side race mounts bolted to white powder-painted L-angles, which were through-bolted to the stringers. Batteries were ratcheted down in aluminum boxes with powder-painted diamond-pattern step plates on top. The same diamond-plate was used to cap the empty cavities between the outer pair of stringers. Marine Machine provided the sea strainers, which were through-bolted to either side of the center stringer. All four trim pumps had been mounted low on the fire wall, which was just forward of a pair of doors that provided access to the fuel tanks. All rigging was race-quality, with stainless cushion clamps exceeding Coast Guard standards (every 12 inches) and nylon tie-wraps to complete the installation. Most of the wiring was routed to the engine compartment through a rigging tube on the starboard side. Shift and throttle cables were tucked neatly beneath the gunwales and routed to the engines from the transom. Simple. Straightforward. Those two terms also could be used to describe the interior. In the cabin, Cigarette glued the padded vinyl headliner directly to the underside of the deck. The hatch was a proprietary unit patented by Cigarette and it was much more stout than the offerings from Bomar or other manufacturers. Way up front, a zippered vinyl drape, complete with the Cigarette logo, concealed the forward-most section of the cabin. Aft of that, the berth featured a thin cushion and rested on nylon fabric stretched at its perimeter and suspended over an opening like a trampoline. The result is weight savings and a comfortable place to lie down. Aft of the berth, the boat came with twin facing lounges, a Porta Potti and two nifty mesh nets to retain all the pillows when you go trouncing along offshore. Exit the cabin through the electric sliding door and you have a cockpit that was as beautiful as it was brawny. Stout manual dropout bolsters up front and an innovative three-across bench in the rear. The rear bench featured high backs and two drop-down armrests. That and the functional windscreen made the cockpit a lot more livable. If we had a complaint, it would be that there were too many Cigarette logos throughout the interior. Few boat names ever approach the peril of becoming a common noun. Cigarette has come as close as it can, yet it continues to build boats that are uncommonly good. 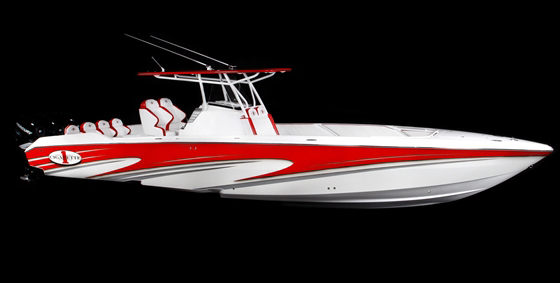 Propellers Mercury Bravo One 15 1/4" x 32"
Upgrade to UltraLeather upholstery ($6,100) and swim platform ($4,900).